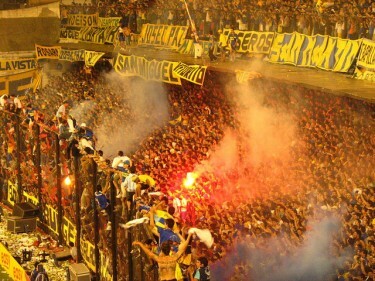 One of many football (soccer) fans’ dreams is to attend one of the Argentinian Boca Juniors’ matches in their famous stadium, “La Bombonera.” Football fans all over the world have many things in common, but the Argentinian – and Boca Juniors – fans in particular are one of the most passionate fans in the world, if not the most passionate. Boca Juniors Fans. Photo taken by Photostat under Creative Commons License. Phoebe-K, who is an American blogger living in Argentina, wrote about Argentinians’ passion for politics and football. Americans will never be as passionate about anything like the Argentines are. Speaking from experience. You get thrills and chills from football games and sports matches, Obama winning presidency and passing the health care reform, American Idol winners and seeing Avatar for the bajillionth time. None of that compares to how the Argentines are about politics en general, the desaparecidos and all that the Dirty War entailed, … economics, and especially fútbol. We wanted to watch one of the most famous football teams and enthusiastic fans, Boca Juniors, and to see the stadium which scares the opponents the most in the world, La Bombonera. In Spanish, groups of supporters at football matches are called “Hinchadas” or “Barras Bravas;” but Boca Juniors fans are usually referred to by the nickname “La 12,” or “The 12th Player.” Such nickname was given to them back in the 1920's. Barras Bravas Mundial elaborates more on the origin of the nickname [es]. The naming of “La 12″ (the twelfth player), by which Boca Juniors’ fans became known, dates back to the year 1925, during the European tour they made that year. At that time, the team was accompanied by a Boca fan called Victoriano Caffarena, who belonged to a wealthy family and funded part of the tour. During that tour he helped the team in everything … establishing a strong relationship with the players, so they named him “Player No. 12″. When they returned back to Argentina, Caffarena was as well known as the players themselves. Nowadays, this nickname is used primarily to name their group of supporters, known as “La 12″. It's one of the most colorful groups of football supporters in South America and the world. They have a band made up of more than 50 musicians who accompany “La 12″ and create that spectacular sound that shakes La Bombonera. And when their team scores, supporters don't just sing but they literally shake the stadium. Gulen and Murat wrote about the famous shake of the Bombonera. Our stand shakes due to their bouncing/jumping like an earthquake. They sing their worldwide known famous cheers “Dale Boca“ abundantly. Then we learn that the shake of the Bombonera is well known and famous. Upon Boca goal, the fans below us bubble over. One of the chants that the supporters sing for Boca is called “Ni la muerte nos va a separar, desde el cielo te voy alentar,” which means “Not even death will separate us. From heaven I'm going to support you.” And in fact it's not just a song, as there are coffins made specially for Boca fans. The coffins only come in two colors – blue and yellow, and fans can have their team's logo engraved for an extra fee. As their biggest rivals River Plate’s colors are red and white , on different locations of the stadium, they printed Coca Cola advertisements not in classical colors of the brand as red-white but with white and black, and Coca Cola does this policy only in a few places of the world. 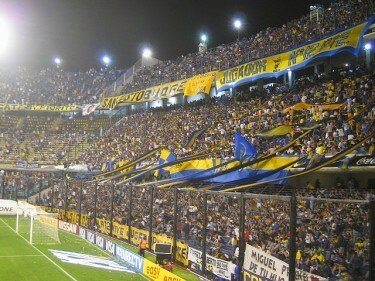 Boca Juniors vs. Pumas. Photo taken by Nica* under Creative Commons License. In a stadium that seats 50,000 people, there are only 2-3 thousand seats for the away fans. and no, they cannot mix with the boca fans. they must be kept in their own separate area. for their own safety, the away fans are penned into this sort of futbol [football] interment camp where they are fenced in by barbed wire. According to our guide, this section also has the worst view of the field. It is not always physical violence that marks the conflict between supporter groups often known as “hinchas” or “barra bravas.” Chants, songs, and signs can be directed at the opposing team and the opposing supporter groups. In some cases, these messages contain racist or xenophobic overtones. Finally, if you too are now interested in attending one of Boca Juniors’ matches, becoming a member of the club might secure your tickets to the game, but you – just like Miss Dewey Decimal – will have to wait for a while in the membership waiting list. La Bombonera is a must see in Argentina!. The only thing that dirt a little this thing is that mostly of fans are low-income people who live in the outskirts of Buenos Aires. In fact, in the province of San Isidro, the most wealthy of Buenos Aires, his favorite sport is rugby! Excelent article, very interesting!